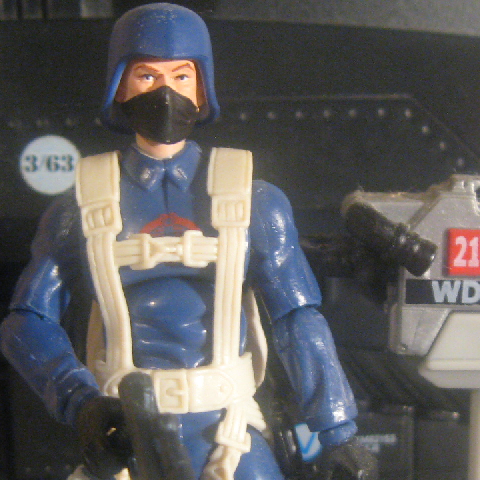 This figure is based on the Cobra Troopers who parachute onto Ellis Island in the opening sequence of the Movie, but they are not distinguished from other Cobra Troopers. Accessories: graphite rifle (08 Tomax's), black knife with silver guard and blade (07 Cobra Officer's), blue helmet (08/XIII Cobra Commander's), silver news camera with black lens and light grey handle, "21 WDO.NJ" on side (new), tall light grey two-piece camera stand with four feet (new), black Cobra figure stand. COBRA PARATROOPER forces are the lowest ranks in the COBRA legions, yet their great numbers provide COBRA with much of its muscle. Thugs, mercenaries, pirates, and assorted lowlifes are recruited from all over the world with promises of future wealth - and instant opportunities to demolish and destroy. After some rudimentary training, they are handed a parachute and weapons and told go out [sic] and wreak havoc. The battle may be on the ground or in the air, but wherever the location, COBRA PARATROOPER forces gleefully leap into the fray, guns blazing and eyes burning with a zeal for battle. "We're the grunts of the COBRA organization, the guys who pour into the field and fight for all we're worth, overpowering the enemy with might, meanness, and machine guns." 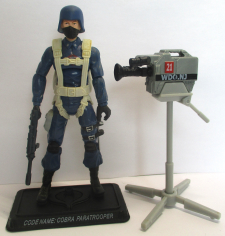 Toy Notes: Boxed with Duke, Alpine, Cobra Commander, small white Cobra C.L.A.W., M.A.S.S. Device beam emitter, and Best of 80s Episodes DVD. Item #35835. This set was short-packed and unevenly distributed so that it was considered a hard-to-find item at the time of its release.